Escape into the mountains of Uttarakhand for a day of adventure at a photogenic campsite. A great way to take a break and reconnect with nature at a beautiful campsite, you'll be surrounded with breathtaking views of rolling hills, painted green with alpine woods of oak and pine. 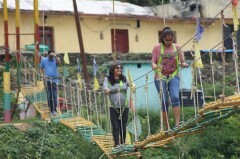 You'll participate in activities like zip-lining, sky bridge, sky walk and valley crossing, all set to the backdrop of spectacular views of mountain peaks and green forests. After a day packed with scenic views of Uttarakhand's misty mountains, you'll gather around a crackling bonfire, for a fitting end to a holiday well spent. Located at an elevation of 8,500 feet, along a mountain ridge in Uttarakhand, the small village of Kanatal is popular camping destination for nature lovers. Surrounded by rolling mountains as far as the eye can see, the campsites of Kanatal are great places to spend a day with pristine views of a gorgeous, hilly landscape. On this camping trip at Kanatal, you'll spend the night in tents, equipped with attached washrooms and comfortable beds. Before you go to bed, you'll gather to celebrate and share memories of the day, around a flaming campfire. • Grab beautiful views during a camping trip to Kanatal. 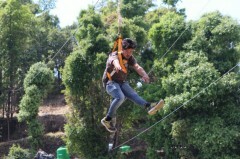 • Participate in several different adventure activities. • Spend the night in tents pitched at a gorgeous campsite. 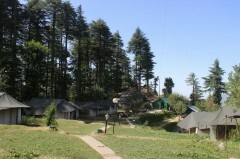 Camping at Kanatal is a non-strenuous activity. However, if you have any cardiac or respiratory conditions, or suffer from knee or spinal problems, please consult your doctor before booking this trip. Travellers are required to follow instructions of the tour guide while participating in any adventure activity at the Kanatal campsite. For cancellations made 45 days or more before check-in date of the Kanatal camping trip: 90% refund. For cancellations made between 44-30 days before check-in date of the Kanatal camping trip: 75% refund. For cancellations made between 29-15 days before check-in date of the Kanatal camping trip: 50% refund. For cancellations made less than 15 days before check-in date of the Kanatal camping trip: no refund. Check-in time at the campsite is 12:00 hrs, while check-out time at the campsite is 10:00 hrs. Travellers are required to purchase a forest entry ticket of INR 20 per person before participating in any adventure activities at the Kanatal campsite. Bookings for children below 5 years will not be charged. Bookings for children between 5-12 years will be charged at a discounted rate of 50%. Bookings for children older than 12 years will not be charged. Accommodation and meals for drivers/staff cannot be provided at the campsite. Travellers are requested to make alternate arrangements. Hot water is provided in buckets, available only between 07:00-10:00 hrs. There is no pick-up for this Kanatal camping trip. There is no drop-off for this Kanatal camping trip. 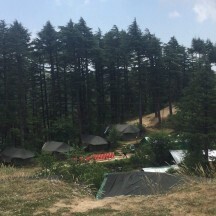 Day 1 of camping in Kanatal: Check-in and enjoy! Arrive at the campsite at Kanatal by 12:00 hrs and check-in to your comfortable tents. You can spend the rest of the day at leisure. 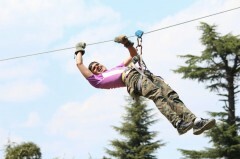 You can participate in a range of adventure activities like sky bridge, zip-lining, sky walk and valley crossing. Alternatively, you can also relax in your tents or venture out to explore the surrounding hills and mountains. As the sun begins to set, you'll gather around a crackling bonfire to some light music. Overnight in tents at Kanatal. Gorgeous views of the campsite, surrounded by pine and oak woods. Wake up to misty morning views of the mountains around Uttarakhand. You'll check-out by 10:00 hrs. Depending on availability, you can also extend your stay at the campsite. Your trip ends here. Overnight in tents at Kanatal. Check-in time at the campsite is 12:00 hrs. 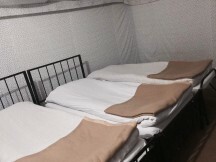 You'll be accommodated in tents with attached washrooms on quad-sharing basis. The tents will contain comfortable beds and blankets. Today's meal package includes lunch, evening snacks and dinner. Today's meal package includes breakfast. Check-out time at the campsite is 10:00 hrs. The campsite is located 75-km or 3-hr drive away from the Dehradun or Rishikesh railway stations. You may board a train to the station and hire a private cab/taxi to travel to the campsite.